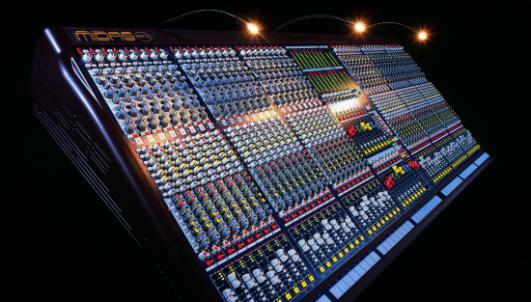 Midas has hosted the European launch of its new Siena console at Prolight + Sound 2005 in Frankfurt. The 16-send Siena is pitched at a similar price-point to the record-selling Verona, with which it shares many proven design techniques. During Siena's first three months in production Midas has had to increase anticipated monthly capacity by 30% to cope with the high international demand, spanning wide-ranging applications. The first two models off the production line were installed into The Sage Gateshead, a prestigious new live music complex in the North of England. "When specifying Siena we felt there was a large gap in the market for a high quality, highly configurable console that had a high output count but was still extremely easy to use in the live environment," says David Cooper, sales and marketing director for Midas and Klark Teknik. "Siena has a feature set sure to appeal to monitor engineers as it is the only console in the world, at this performance level that can easily handle in ear monitors. Importantly for rental companies, it's also versatile enough to be used as a front of house console when required." This is certainly proving to be the case at The Sage Gateshead, where they are being used for a wide range of mixing duties as well as onstage monitoring. Their small footprint allows them to be moved easily between the Main Hall One (1,700 seats), Hall Two (around 400 seats), Northern Rock Foundation Hall, the Concourse, the Barbour Room and the performance square for outdoor gigs. "One of the most useful features is the number of auxes available, and we're also looking forward to the flexibility for in ear stereo mixing," says Chris Durant, The Sage Gateshead's Head of Technical Operations. "We wanted recognised desks that would be good for touring engineers, but also laid out in a way that gives ease of use for less experienced engineers, which is great for our education work." Available in six frame sizes, from 24 up to 64 channels, Siena features 16 dedicated aux sends that can be simply configured as stereo pairs if required. In common with Verona are the high stability, low noise mic preamps and four-band EQ section, which in turn are based on those of the XL4. Other features include switchable insert points on all outputs, the unique Solo Tracking System (STS) which allows the solo'd outputs to be shown on the Klark Teknik Helix EQ system, along with clear and accurate, long throw, output metering. "We are anticipating an extremely positive market response to Siena," continues Cooper. "It will prove to be an extremely valuable workhorse, given its combination of performance, flexibility, and compact footprint. This is a console that audio engineers will love to use and rental companies will feel confident investing in."